I love this recipe, because it’s easy-peasy to make ahead a big batch of my basic buckwheat sourdough that requires no sourdough starter. Then, you can store it in fridge to make fresh pancake batter every morning (or whenever you need). Definitely read through the whole sourdough recipe post to find out the benefits and other ways to use this basic buckwheat sourdough. 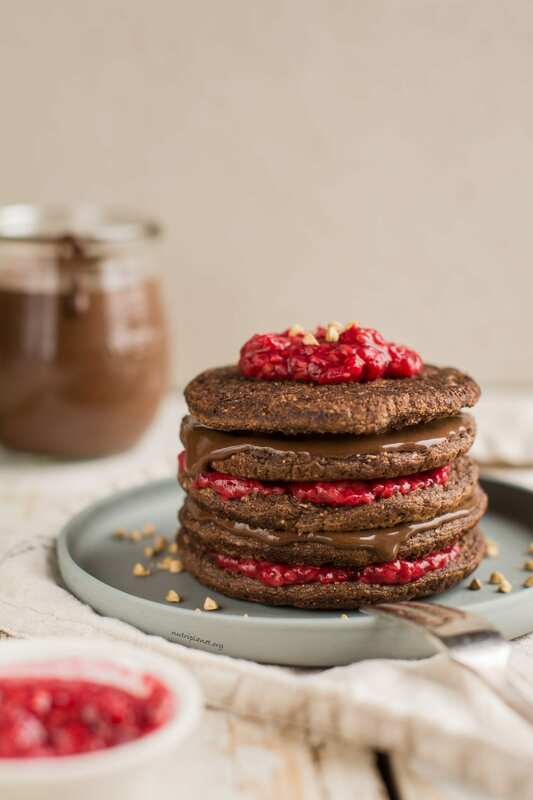 Make yourself a small pancake tart with my Healthy Chocolate Sauce and raspberry jam. In retrospect, do you still remember the times when vegan gluten-free pancakes were something out of this world? I definitely do! However, then came all the dairy-free options, flax egg, gluten-free flours etc. Suddenly, it became so easy to prepare vegan and gluten-free recipes. Today, it’s just down to making your research, getting the ingredients and following recipes that others have developed. Don’t you agree? Should you be interested in reading more on how to cook gluten-free, dairy-free, sugar-free and oil-free, check out my thorough book Plant-Based Made Easy: The Complete Guide to Transitioning to Healthy Whole Food Diet including full 2-week meal plan with 50+ recipes. Easy jam: thaw some berries, mash them and mix in a bit of ground chia seeds. Sweeten, if necessary. So easy to make (you just need to plan ahead for the sourdough). Full of chocolate flavour (which I can’t resist). Delicious low-glycemic and Candida diet friendly breakfast. Gluten-free, soy-free, nut-free and peanut-free (for those with food allergies and intolerance). Relatively low-fat (below 25% of kcal). 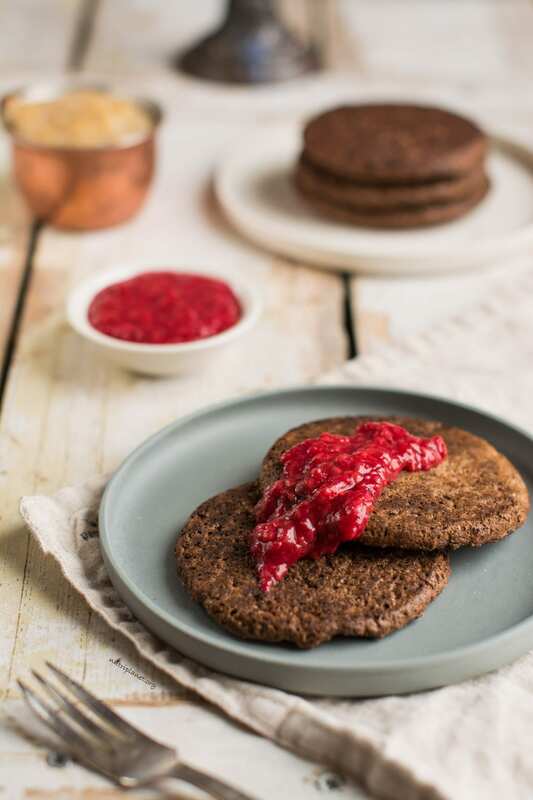 Should you be a fan of sourdough recipes (like myself), definitely make my Fermented Buckwheat Bread and Light Buckwheat Sourdough Pancakes (includes banana) as well. 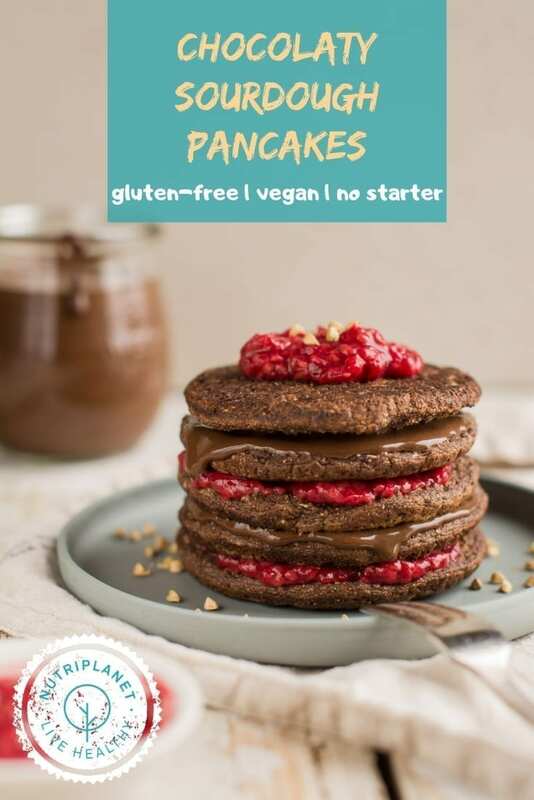 Furthermore, I have published many more recipes for vegan gluten-free pancakes that you might find worth trying out – Chocolaty Sweet Potato Pancakes, Tofu and Beet Pancakes, Tofu and Cinnamon Pancakes, Chilli Tofu and Kale Pancakes, Parsnip and Carrot Pancakes, Blueberry-Beet Pancakes, Matcha and Ginger Pancakes, Veggie Pancakes etc. I especially love the tofu pancake recipes – they are like ricotta pancakes and have very low glycemic load. So, if you’re fine with soy products, definitely check those recipes out too! Start by making buckwheat sourdough. Follow my basic sourdough recipe. Begin making the sourdough about 24 hours before you plan to prepare the pancakes. Once the sourdough is ready, add four heaped tablespoons to a medium bowl with ground chia seeds, oat bran and Himalayan salt. Mix until you have a thick paste. Then, start adding water gradually. Finally, mix in all the remaining dry ingredients (coconut flour, carob, cocoa and cinnamon). Let the batter rest for 5-10 minutes to allow the chia seeds to expand. Grated or processed cauliflower is the last to join the crowd. Don’t worry, the batter is supposed to be quite thick. However, when you start frying and you find it too thick, add a few tablespoons of water. Next, add a few drops of coconut oil or avocado oil onto a good quality non-stick pan and swipe it off with folded kitchen paper. Let all the oil absorb into the paper and use it to swipe the pan clean between pancakes. Heat the pan up over medium heat. 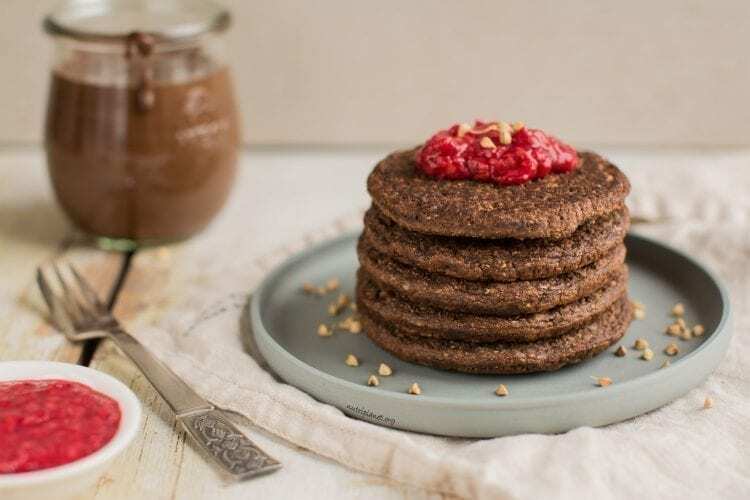 Nutritional info per pancake (1/12 of the recipe): 47.2 kcal, 5.3g carbohydrates (72.3% of kcal), 1.31g fats (24.9% of kcal), 1.95g protein (16.5% of kcal), 3.23g fibre, and 30.4mg sodium. I didn’t bring out glycemic load points for those vegan gluten-free pancakes, because there’s no way of knowing the glycemic load of sourdough. While it is clear that sprouting and fermenting lowers the glycemic load of grains and legumes, I have not found a database that would state the degree by which it actually diminishes. If you do know, please let me know! However, to give you some kind of idea, I calculated the GL points before fermentation, i.e. 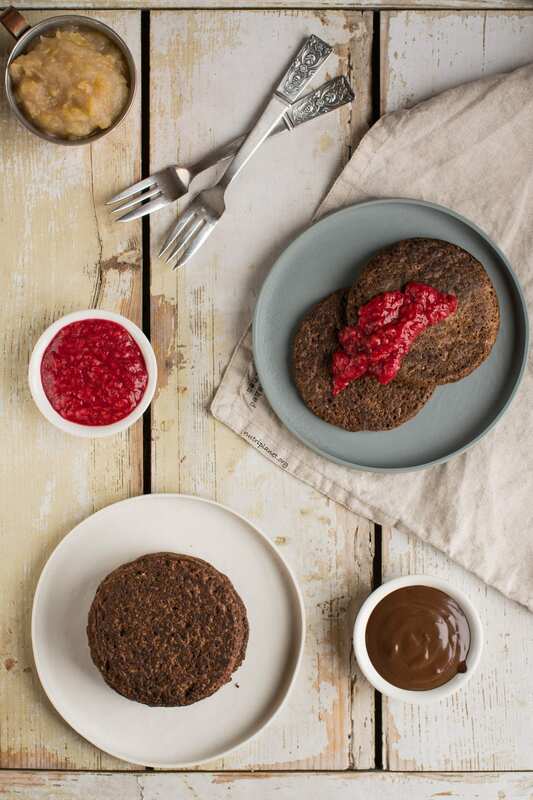 2.6 points per pancake (1/12 of the recipe), 1.63 points of which come from buckwheat. 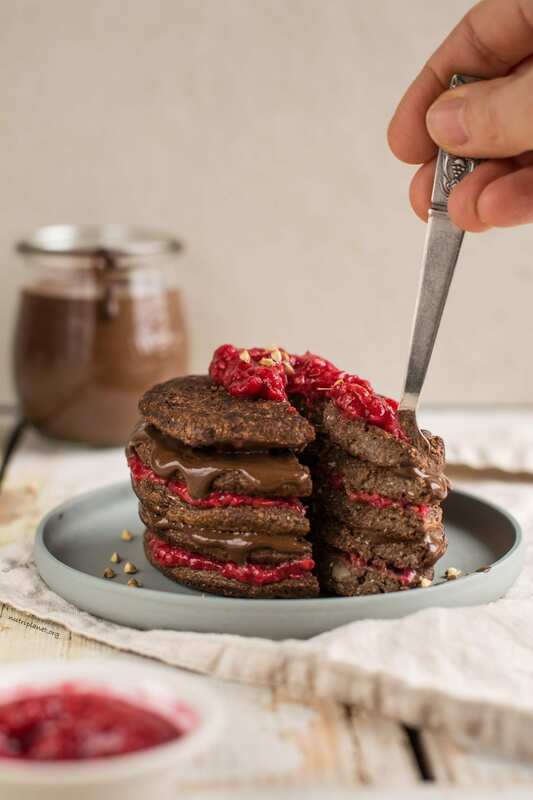 Healthy Chocolate Sauce would be heavenly with those vegan pancakes. Homemade Applesauce is very good option if you’re looking for leaner toppings. Follow the same instructions to make pear and plum sauce. 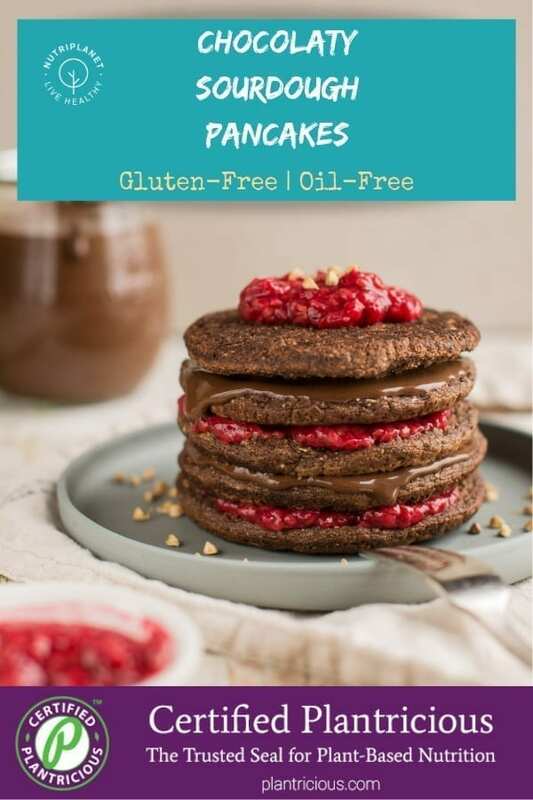 Vegan Date-Free Caramel Sauce gives a perfect contrast of colours when dripped onto chocolate pancakes. Alternatively, thaw (if frozen) and mash some berries (blueberries, raspberries, strawberries, blackberries, cherries etc.). Mix them with a bit of ground chia seeds and sweetener of choice. Finally, pureed fruits such as mango, kiwi, and banana make an excellent pancake topping as well. Make sure to add some lemon juice to banana puree to prevent it from browning. Make them even chocolatier by adding chocolate chips while frying (check my tutorial video above). I’m using dark chocolate chips sweetened with birch xylitol. Use 60 grams of batter for really thick and chubby pancakes (you’ll get 10 pancakes) and 50 grams for a bit thinner ones (you’ll get 12 pancakes). Should you want to prepare the sourdough only for pancakes, i.e. with no leftovers, use 53g (1.9oz) of dry buckwheat groats and 48g (1.7oz) of water for blending (+ water for soaking) to make the sourdough. If you want to make your pancakes sweeter, add some stevia or xylitol to the batter. 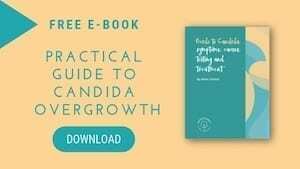 Should you not struggle with Candida overgrowth or blood sugar fluctuations, you may also choose other sweetener of choice – date paste or sugar, maple syrup, and coconut sugar or nectar. If you don’t like coconut flour, replace it with any other fat-reduced nut or seed flour, e.g. almond flour, pumpkin seed flour, sunflower seed flour etc. Even chestnut flour works in this recipe. Instead of cauliflower you can add other finely grated raw veggies, e.g. carrot, zucchini or beetroot or leave it out entirely. In order to make those vegan gluten-free pancakes even heartier, replace all or some of the water with additive-free plant-based milk, e.g. almond milk, hemp milk, coconut milk, oat milk, rice milk, soy milk etc. You most probably do not need to add any sweetener, if you use naturally sweet milks such as oat and rice milk. I find that this recipe does just fine without baking powder or baking soda. However, if you think you need to use something to boost the fluffiness of those pancakes, feel free to add a teaspoon of aluminium-free baking powder to the batter. Furthermore, you can use waffle iron or silicone moulds to make vegan waffles with the same pancake recipe. That is a beautiful tart and a fantastic sounding recipe. Your posts are always easy to understand and Helpful. Thank You………………..
I’m so happy to hear that! Glad to inspire and be of help! These pancakes look scrumptious!! Well done. Thank you so much Rosa! Your pancake stack looked so inviting as well! These look so delicious, and with chocolate sauce and jam? Yes please!